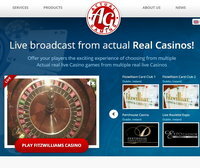 Actual Gaming software transmits live games of roulette, baccarat and blackjack from real casinos located in Dublin. Actual Gaming has perfected the technology that allows online players to bet in the presence of players who are physically present in the Fitzwilliam Card Club and the Penthouse Casino. So there’s no need to go to a land based casino when you can play in your own home from the comfort of your sofa. In contrast to most live gaming software which uses tables in a studio, Actual Gaming goes much further by filming tables in real casinos and by transmitting the game to players’ screens in real time. Cameras placed over the roulette table give players the feeling of being in a real casino and they can see the results in real time thanks to the zoom on the roulette wheel. At the card tables, the cameras are placed opposite the dealers and these scan the cards so that players know what is going on. The Actual Gaming software means that players don’t have to travel to bricks and mortar casinos and the realism is first class as virtual players mix with the players seated at the tables. Lucky31 Casino: a leader running on this software. Lucky31 Casino is an excellent online casino with a good reputation for reliability. Lucky Live Casino: Lucky Live Casino gives online players the means to bet at roulette and baccarat tables from three Dublin land based casinos just as if they were there! Casino Extra: A more recent casino, Casino Extra also uses this excellent software along with technology from Visionary IGaming. This online casino uses several types of software that offer various gaming tables in different but always enjoyable surroundings.